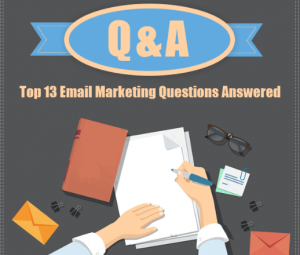 Keep reading to get your basic email marketing questions answered. #1. Should I buy a subscribers list just to kick off my email marketing? The answer is strictly, NO! You should not buy a list from third party. It’s a black-hat tactic. You should learn some manners and don’t interrupt people if they don’t want to hear from you. Email marketing is permission based marketing. If they are not your subscribers and they get an email from you, they’ll be less likely to open or click on it and they could mark you as blacklisted or spam because they don’t know you. It will negatively affect your deliverability rate and the success of your email marketing. For good conversion you need to build an organic list. #2. How do I build my email marketing list with white-hat ways? Okay, we recommended you not to buy a list. so if you can’t buy email lists then how to build a list organically? Organic list means people or clients must opt in to hear from your company. In order to successful email marketing we need to focus on growing email list regularly. There are many white-hat ways to collect email addresses like: Add signup forms on website, blog page & other relevant pages, run offers on social media, host a webinar or event, create different landing pages, use twitter ad platform and many more. #3. What are different types of Opt-in? Double/Confirmed opt-in – A new subscriber enters his/her contact information, the post-subscribe thank-you page may alert him to look for an email. Once he receives that email, he’ll need to click on a link or button to confirm the subscription. A double opt-in process help to build a strong and quality list. #4. What are different types of email I can send? There are lots of types of emails you can send and that are work for your business. Email newsletters are just one kind that fits under the larger umbrella of email marketing and a great way to build relationships with your clients and subscribers. In an email newsletter you can include different pieces of content – blog posts, announcements of new product or service, special offer & discounts, information about events or webinar. Promotional emails contain offer, discount and sales pitch to acquire a customer. Make your offer clear (no need of explanation) and include clear call-to-action like “Buy Now”, “Shop Now” etc. Transnational emails are expected messages that are received after a specific user action has taken place. Examples – order confirmation, welcome message, account information, invoices etc. #5. How often should I be sending emails? Email marketing works well for your business when you make your subscribers or customers happy. You must regularly engage with your subscribers to make them satisfy. 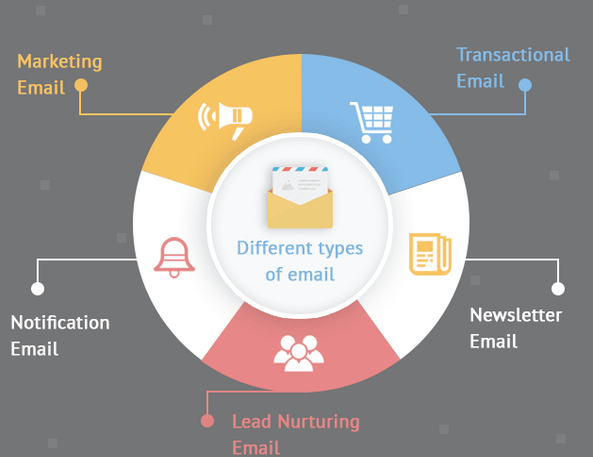 Email consistency depends on your type of business. Maybe you create a lot of content and you share it with your list or maybe you run a store & your list doesn’t want to hear from you more than once a week. We must keep consistent with our timing and frequency. #6. How to prevent my email stay out of spam folder? In order to prevent your email to stay out of the spam folder is to use opt-in and organic email list– never use purchased list. If you want to avoid SPAM, just follow one rule - NEVER send any email, subscribers don’t expect or they don’t want. Design beautiful and high performing email campaign and make your unsubscribe link easy to see for them. It gives recipients an idea about your message content outline. Don’t repeat subject line in your pre-header text. Create unique. #8. How do I make sure my emails will all look great when delivered? In order to get good results, we need to evaluate our campaign to see how it will look. Test it in different web-mails and make sure that content & media looks good in all platforms. Email should be mobile responsive and test it before send to see how it looks in different mobile devices. Remember, More than 60% of emails are opened on a mobile device. A/B testing is one of the best way to check which version of email looks good. #9. How do I write a subject line which will perform better? Subject line is the most important element which tell recipients what you offering in your email. You should create short, sweet, & action-oriented subject line and keep it under 50 characters (for mobile users). #10. How do I track my email marketing campaign? There are some important factors which play a vital role in order to measure your campaign success – Open rate, click through rate (CTR),conversion rate, delivery rate, bounce rate, unsubscribe rate, etc. #11. What’s the difference between a hard bounce and a soft bounce? There are two type of bounces – Soft bounce and Hard bounce. Soft bounce is temporary problem. it happens when recipients inbox is full or server is temporarily down. Hard bounce is permanent failure to deliver an email. Emails never get delivered. It is due to invalid or non-existent email address. You should remove these contacts from your list. We must keep an eye on email bounce rate. #12. How do I prevent people from unsubscribing from my emails? Your email must contain an unsubscribe link so people who don’t wish to receive emails from your business can unsubscribe from your list anytime. You should always make this process easy by providing a clearly visible link in every email message. Create a email preference center that allows subscribers to change their preferences like email frequency, content type etc. What is considered a decent unsubscribe rate – under 1%. In order to keep your unsubscribe rate low, you must send relevant, useful, interesting & engaging content, properly segmenting your list and you must follow CAN-SPAM Act. #13. Will Social media take over email marketing? There is a misconception that email is dead! But this is not true. Email is still one of the most hot and stylish tactic for businesses. There is a hot debate – which is most effective, email or social media? Don’t consider email and social media as a competitors. Use these tools together for generating leads and sales. Integrate email with social media and get best results. Did you have any more email marketing questions in your mind that we can mention here? Please share with us in comment box below!